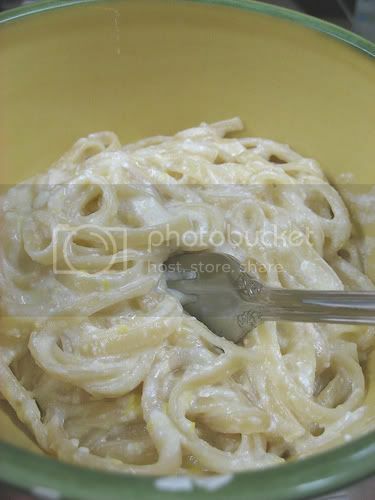 This mock (or cheater’s) Alfredo sauce is not exactly bargain basement frugality, neither is it a low calorie option. However besides being quick and easy it is also much less expensive and less caloric than full fledged Alfredo-which call for a lot more butter, heavy cream, and real fresh Parmesan cheese. Preparing a more luxurious item like this at home is a frugal alternative to eating it out. It also can alleviate some of the menu doldrums and make you feel less “deprived”. I also find it a way to stretch out and use up a little bit of leftover meat. Personally I like to add some leftover baked fish (trout from my BIL or Salmon from a family friend) but you could also use some chicken, turkey or pork. Suddenly a half or single serving of meat that could have languished in the fridge can become a full fledged, and somewhat gourmet meal. Broccoli also makes a classy and tasty addition. Melt everything together in a small saucepan. I find that if you cut the cream cheese up into small blocks before adding them, and use a whisk to stir it goes together better. Keep the heat on medium-you don’t want to boil it and curdle the milk (ick). Toss over your favorite pasta and serve to the crowd. Salad and bread sticks make a nice accompaniment. *I use the cheapo Aldi’s brand of parm cheese in a shaker. I’ve been known to shave the amount down to ½ cup, depending on how much I had in the fridge. **Canned evaporated skim milk is a nice creamy alternative-regular milk works fine but isn’t quite as rich or creamy. I miss alfredo sauce, my husband is lactose intolerant so I have to go without too. I have settled into making a really nice garlic butter sauce instead, and while it isn’t much healthier, it is a little cheaper to make and my husband can eat it too. I also add broccoli, or sometimes spinach to make it a more “grown-up” meal. I make the exact same recipe- when the sauce is done I add cut up ham and peas- then put it all on noodles! Once complete meal that my entire family loves! This looks good I will have to try it. I recently tried a “Quick and Easy Stove-Top Tuna Casserole” recipe that includes fish with a lighter white sauce. I found it on the recipezaar site that you recommended to me quite a long time ago. The link for the recipe is: http://www.recipezaar.com/106969. I liked it and so did my husband, though he admitted that he hadn’t expected to like it when I described what I was making. I made a couple adaptations that had been suggested by commenters on the site (used mixed veggies instead of peas, added some parmesan cheese). It is a thrifty recipe and seems like a versatile one that could be adapted to use up various leftovers. How much pasta do you mix with ths sauce? 1/2 pound, 1 pound? I’m looking for a guideline. K-J Garlic Butter Sauce sounds yummy too! Can’t go wrong with those two things. Anon-it really depends. Sometimes I cook the noodles and then just ladle the sauce over it, so each person can control how much they get. This last time I mixed in the recipe with an entire box of spaghetti-so it was less saucy. Sort of a personal preference thing. I’d do the ladle method the first time so you can see what you think. I saw this recipe on here today and I had the ingredients so I made it for dinner. It’s not bad, but it just tasted like cream cheese too much. I love cream cheese, but I guess I’m too used to having it in cheese cake or something sweet! Not bad over all though. And it’s super quick!